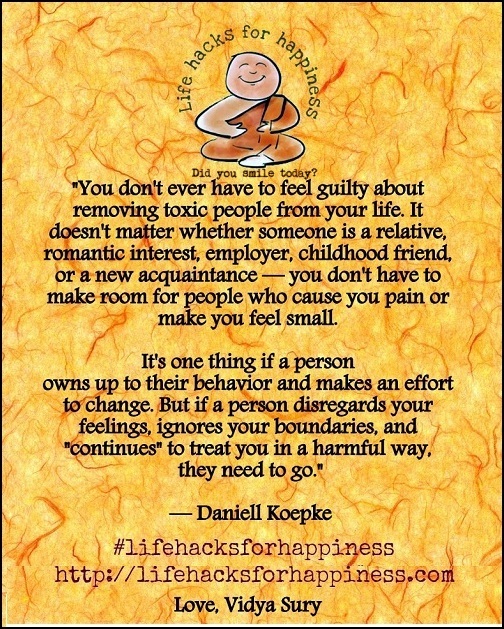 So lose the guilt. Let go! I have done that and even though I have felt sad at the loss, I have been happier without them in my life in the long run. It gave me the control to no longer feel the need to take their meanness in stride because they were family. Hugs, Kathy. Easier said than done, no? I still struggle with it, because the memories never quite leave us. Only practice can take us to that peaceful place. Very true words… but i’m too insecure sometimes to trust anyone else soon… and i fear i might be left alone sometimes..
Pratikshya, what you feel is absolutely natural. I went through a phase like that in high school. That’s when I began writing a diary. And because it was a book I could keep safely in my desk, I just poured and vented out all my feelings. The thing is, most things feel huge inside our heads. When we let them out, they look much smaller. 🙂 Divert your mind towards things you enjoy doing. That helps. Hugs to you!